Windhelm Military Camp is an Imperial camp southeast of Windhelm. This camp is added during the Civil War quest Battle for Windhelm. It contains three catapults and many tents. At any other time, this spot is occupied by a hunter camp consisting of three tents, a dead deer, some food, and three hunters. The catapults may be fired at the city. This does not affect the outcome of the battle, however. 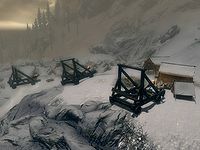 After the Battle for Windhelm, the camp's marker is removed from the world map, as will the Imperial Soldiers that are there, but the camp itself is not disbanded, and you can still fire the catapults at Windhelm, without consequences. This page was last modified on 22 August 2015, at 11:09.